Welcome to our new St. Albert location. This boutique optometry clinic located within Pearle Vision offers a smaller scale version of our downtown location. Focused on eyeglasses and one-to-one eye health exams. We’re excited to announce the introduction of our new St. Albert Location. This boutique clinic is located within Pearle Vision in the Inglewood Towne Centre, and is focused on routine eye health examinations and emergency eye care. Eye Health Evaluations | Diabetes, high blood pressure, glaucoma, cataracts, etc. 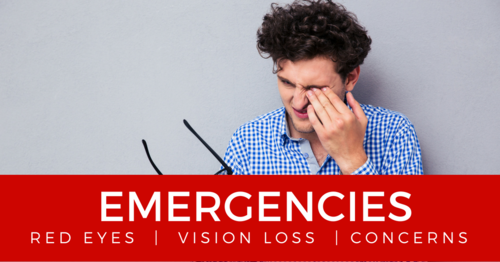 Eye Health Concerns | Red Eyes, Eye Infections, Foreign Object Removal, etc. We currently do not provide contact lens services at this location. We can also direct bill many insurance providers, or we can provide you with a detailed receipt if you must submit your claims directly.